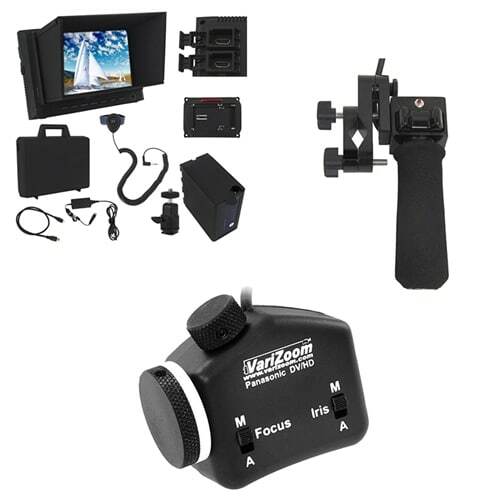 This zoom/focus/monitor kit includes the VZPGPZ pistol-grip zoom unit, VZPFI focus/iris unit,and VM7K on-camera monitor system. This setup provides studio-level control of Panasonic cameras in an affordable and portable package that works as well in the field as it does in the studio. This zoom/focus/monitor kit includes the VZPGPZ pistol-grip zoom unit, VZPFI focus/iris unit,and VM7K on-camera monitor system. This setup provides studio-level control of Panasonic cameras such as AG-DVX200, HC-X1000K, AJ-PX270, AG-HPX255, AG-AC160 in an affordable and portable package that works as well in the field as it does in the studio. For more detailed info, visit the individual product pages.